His teacher said there is no water fountain, and the nearest water well is 5,000 meters away. Ryan had to convert meters to steps, and when he found that it was only ten steps to his water fountain he began to realize how difficult 5,000 steps would be. So the idea of providing a well sounded pretty significant and he decided to try to provide one. He went home and asked his parents for the seventy dollar cost. He says his parent sat him down and told him that since it was not a small amount of money, he would have to earn it over time. By the time he had done enough chores to have earned seventy dollars the program at his school was over. 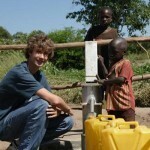 When he contacted organizations that provide wells in Africa, he found the total cost to get a well dug and functioning was more like two thousand dollars. He quickly determined that he would not be able to earn that much through house chores. So at the age of seven, Ryan began public speaking throughout his community. “After that,” he reports, “ it became less and less of my project and more of everyone’s project. The entire community got involved and slowly the country and finally the world.” He established the Ryan’s Well Foundation, which over the past twelve years has completed over eight hundred water projects at the cost of millions of dollars. Those projects have helped over 700,000 people in more than a dozen countries. Ryan, now a very articulate and mature young man of twenty, explains that his foundation does three basic things. First they build clean water wells. “Every day,” he says, “six thousand children die because they don’t have clean water.” The second thing they do is educate whole populations about the importance of clean water. Instead of building a well and walking away, they involve the whole village in the building of the well so they also know how to fix it when it breaks. This makes the project sustainable. And the third and perhaps most important thing they do, Ryan thinks, is to help all people to figure out, in his words, “their puzzle piece” of how they fit in to make the world a better place. If everyone does that, the world will be a better place. Ryan has certainly found his puzzle piece and is making the world a better place.